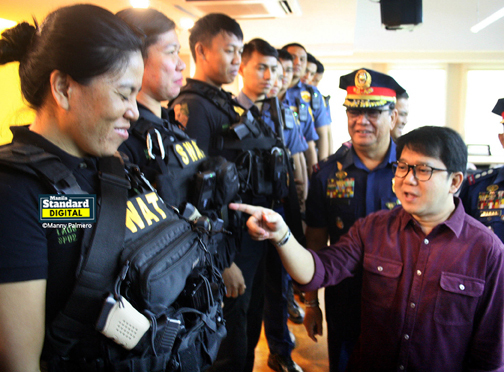 Quezon City Mayor Herbert Bautista on Wednesday turned over 300 body-worn cameras and 3,000 handcuffs to the Quezon City Police District’s Chief Supt. Joselito Esquivel Jr. to beef up the local police’s crimefighting capability. Bautista, along with his chief of staff Jay Marzan, led the turnover ceremony. He cited the importance of the new equipment to help police officers in their fight against illegal drugs and other forms of criminality. Esquivel expressed gratitude to Bautista for his continuing support to the city police. “With the acquisition of the brand-new devices, the QCPD will be a step ahead of other units of the Philippine National Police as far as logistics and mobilization are concerned,” he said. He called on the members of QCPD to give their constituents more than their money’s worth as show gratitude and appreciation.